It's funny how we can get so fixated on or dedicated to something, like training, we think is terribly important. Then in an instant, it all seems insignificant and even silly that it mattered so much in the first place. That's sort of where I am with my half marathon training right now (and life in general). I had an awesome week of exercise -- complete with running, swimming, and biking -- and even ran a comfortably fast 10-mile race. I was starting to feel invincible, which is a way I haven't felt in a very long time regarding running. And then last week I didn't break 10 miles total. What I'm taking the time to focus on with my running and myself is just getting one foot in front of the other. Not so much for my physical health (though keeping it up during rough times is certainly important), but more for my mental well being. 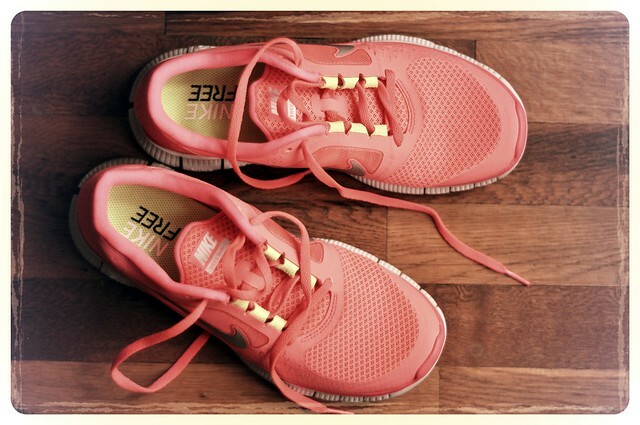 There have been days when even the thought of lacing up my sneakers and jogging down the street makes me shudder. When I have absolutely no energy to give to anything but stewing and worrying about things I can't control. When looking outdoors and thinking of taking time for myself -- even 20 minutes -- seems far too selfish. What I realized on tonight's extremely labored and uncomfortable 4-miler (that should have been 12) is that there's nothing selfish at all about taking care of myself. That the number of miles and the pace don't matter. That walk-breaks when I get too inside my head are necessary and welcomed. That just moving along and getting nervous energy out in a positive way is important for me and for those around me. Those 4 miles hurt more than I'd like to admit, but what hurts more is that overwhelming feeling of paralysis when I do nothing. I need motion to move forward both physically and metaphorically. And I feel lucky to have running as a coping mechanism. In the past, I'd turn to other things to get by, whether it'd be junk food or one too many drinks on a given night or simply not coping at all and letting issues swallow me whole. So, for the next however long, because at this point we really don't know, I'll get in miles however I can get them. If that's a single mile every other day -- great. If I feel like doing more, fantastic. I know a 1:40 half is in me somewhere, but it will have to wait. I will keep moving with the only goal being momentum.